The Republicans may now be "the party of no," but it remains to be seen who exactly the Democrats are. Senate Finance Committee Chairman Sen. Max Baucus, D-Mont. talks with reporters on Capitol Hill, Wednesday, Feb. 11, 2009. If ever there was a defining moment for the Democratic Party post-Bush, it is right now, with healthcare reform hanging in the balance. The party has a popular president, a strong majority in the House and a filibuster-proof sixty-member caucus in the Senate. It also has 72 percent of all Americans–including 87 percent of Democrats and 50 percent of Republicans–saying they want a public plan option to compete with the waste and greed of private, for-profit plans. Only the Democrats could blow this one. And if they do, there will be plenty of blame to spread around. Starting with Senator Max Baucus. 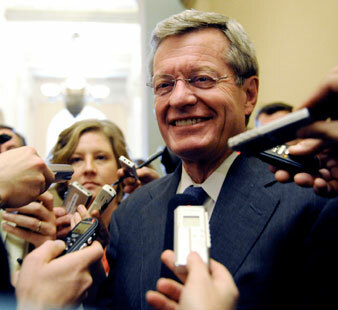 Baucus has emerged as perhaps the greatest obstacle to achieving a robust public plan. Along with the Health, Education, Labor and Pensions (HELP) Committee, the Finance Committee he chairs is tasked with drafting the Senate’s healthcare bill. There was an early omen when Baucus blackballed single-payer advocates from his “roundtable discussions”–billed as including all stakeholders–and even had some of them arrested. It would be easy enough to dismiss him as a sellout–after all, since 1989 the healthcare industry has lavished Baucus with $3,820,031, according to the Center for Responsive Politics. Only President Obama, former presidential candidates John McCain and John Kerry, and Senator Arlen Specter are greater beneficiaries. Baucus has received $1,078,605 from pharmaceuticals, third in Congress; $1,377,776 from health professionals, eleventh in Congress; $667,099 from health insurance companies, fifth in Congress; and $414,042 from hospitals, eighth in Congress. And these days, there are so many former Baucus staffers among the healthcare industry lobbyists now being paid a jaw-dropping $1.4 million per day that when they walk the halls of Congress it looks like a Baucus Reunion Tour. But big bucks aside, it could be that this is simply who Sen. Baucus is. This is, after all, the same guy who just months ago voted to continue regressive, Bush-like tax policies with a new $100 billion-plus break for the wealthiest two-tenths of 1 percent of Americans. (The measure was defeated.) So it should come as little surprise that he and his Republican-dominated “Coalition of the Willing” will now offer an essentially Republican bill–with windfall profits in the billions for the insurance and drug companies–at a moment when the nation is demanding real reform and a clean break from profit-driven healthcare. 2) make sure his sixty-member caucus votes to end the GOP filibuster, even if the Baucuses, Landrieus and Nelsons then vote against the final bill. Reid had better find out what those senators on the fence covet–and tell them that if they don’t vote for cloture, they can kiss whatever it is they want goodbye. The Republicans may now be “the party of no,” but it remains to be seen who exactly the Democrats are. Is it the party of soaring rhetoric but corporate values? The party of expediency? Or is it the party that–when everything is going its way–will stand up and fight for the people?